Why not? Kubernetes is here to stay and it looked fun. Plus, internships can be designed to explore a plethora of options to achieve a non-predefined result. ToThePoint offers many different kind of internships with the goal of developing real life solutions to eventually create a working product. We’re dubbing this “innovative technologies” for future references. Whether you like it or not — Kubernetes is here to stay. 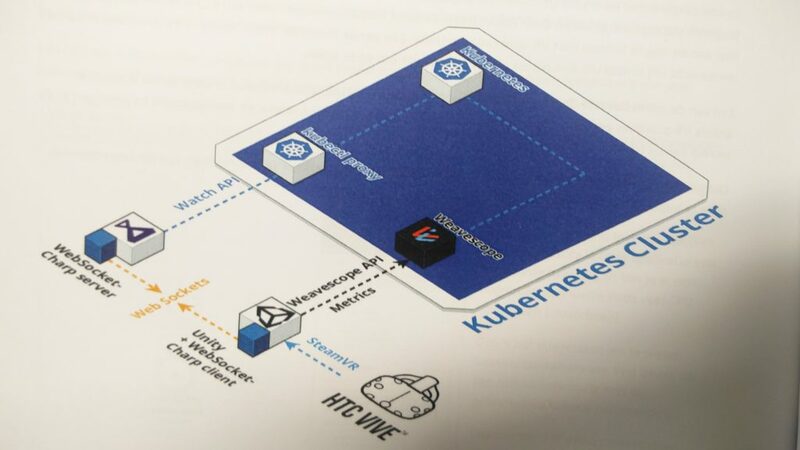 As we are trying to find ways to manage it with ease, we explored the idea of visualising a Kubernetes cluster using a Virtual Reality environment. During his internship, Brent Lucas found a way to deliver. Read the transcript of the interview below. 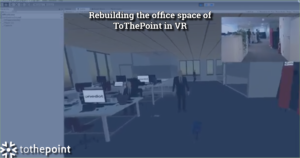 Brent Lucas talks about his VR adventures as he managed to visualise a Kubernetes cluster during his internship at ToThePoint. Introduce yourself: what is your name and where are you from? My name is Brent, I’m from Hoboken (Belgium). I graduated at KDG (Karel de Grote hogeschool) as an application developer last year. I recently started working at ToThePoint as an evolutionary architect. 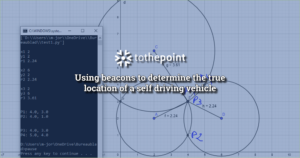 How did you find out about ToThePoint? During my last year of school I did my apprenticeship here at ToThePoint. It was actually quite a funny story how I got here. During an internship convention hosted by my school, we had to present our top picks of available internships, but we didn’t know that. So we kind of went to this job fair ill-prepared. There were a few options predisposed but we did not see ToThePoint on this list. But we got randomly approached by Janosh, a ToThePoint employee and he seemed like a really nice guy. Janosh shared with us his results of his own internship from the year before, which turned out to be “The Wall”. That looked pretty sweet so our top pick was ToThePoint. That’s pretty much how we stumbled upon this IT consultancy firm. What was the subject of your internship and how did you come into contact with it? During our internship we had to visualise a Kubernetes cluster in VR so we could have a management tool for logging purposes of Kubernetes clusters. We initially had the option between three different assignments, of which we had to pick two. But the Kubernetes VR cluster assignment was not listed on those three. During our visit at ToThePoint for our first internship proposition, we talked to Steven and the mentors and we were shared the details of the assignment. During this talk, we discovered the Kubernetes assignment and it looked challenging enough so we went for it. This turned out to be quite a success story. So you stumbled inside without even knowing ToThePoint exists and you took upon a challenge of which you had no idea it was to be presented? Hah, yes. That was part of the challenge. I liked getting started with it. How did you start off with your assignment? At ToThePoint there is not one preferred tech stack, this became clear immediately. So we got free rein when it comes to completing this challenge. We started off by researching which of the different technologies exist to write VR applications in. We find out about a few of them. A-frame is one of them — a browser to generate 3D worlds in which you can dive using a VR system. Unity is another one, it’s a game engine that also has Steam VR support. We had heard of both these technologies beforehand at school so we went with it because they seemed like the better choice. Was there a strict deadline? Our internship lasted for 8 weeks, which is actually pretty short. But because we were working on it with a team of two developers, we managed to squeeze in 16 weeks worth of man hours. Using a sprintplanning that we had set up together with our mentor Ken, we could follow up on our progress on a weekly basis. This planning was loosely fixed, which enabled us to adapt to any given situation. It was pretty much our sole responsibility to organise these efforts. Did you use the Agile method? Yes. Armed with a sprint planning with one heck of a backlog we decided on a weekly basis which items we could finish given the time available. By the end of the internship we also had a log of “up next” items that looked like fun extra’s for the future. Mostly the independent way of working. To be able and trusted to make the right decisions when it comes to picking a certain technology stack. At school you mostly get the assignment to “make *this* in *that* technology”. At ToThePoint it was rather: “okay we have this idea, get on with it. How and when you do it, it doesn’t really matter.” One other important lesson was: do your research. Are there things that you’ve learned during your internship that you now use on a daily basis? Yes, mostly working with new technologies that I’ve never even heard of, like working in VR, which are completely new. At school we lightly touched this subject but during the internship we really explored it. 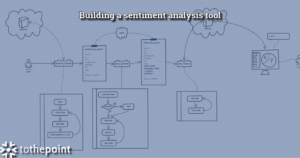 I now notice during my current project as a consultant, that when we are considering new technologies, that I’m having a pretty easy time getting started with it. Or should I say: DARE to start with it. When you are starting off with a new technology, are there moments in place where you can ask colleague consultants about extra information? Yes we have a whole team of people behind ToThePoint, like seniors, on which you can cound to ask questions. This is nice, especially as a junior, being able to learn so much on short notice and to have a whole array of experts available to ask questions to and who are willing to help you all day every day. What, to you, is the DNA of ToThePoint? Welp, the DNA of ToThePoint? The people that work here. People that work at ToThePoint are the core of ToThePoint’s DNA. I believe that everyone has their own heritage and their own personal goals, but at ToThePoint everyone gets a chance to reach their goals or to at least work on them. I think that’s awesome. What does a consultant need to be a match with ToThePoint? What is the biggest difference between ToThePoint and other Cronos companies? That will be the boss, Steven. He’s such a chill dude. Every time I talked to him, either during my internship or during my talks, he always sounds super enthusiastic and with passion about the stuff that’s currently keeping him busy. He’s pretty much the work horse behind ToThePoint. Brent! .. for the interview and many luck with your current assignment! Looking for an internship at ToThePoint?